This July the Dutch Culture Centre, Shanghai will host MADE IN HOLLAND, an unique collaboration between the three international music competitions of The Netherlands: The International Franz Liszt Piano Competition (Utrecht), International Vocal Competition (’s-Hertogenbosch) and TROMP International Music Competition (Eindhoven). 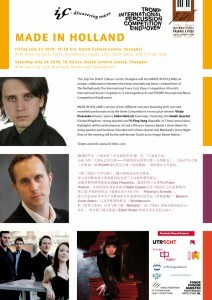 MADE IN HOLLAND consists of two different concerts featuring both solo and ensemble performances by the three Competitions’ recent prize winners Vitaly Pisarenko (Russia / piano), Falko Hönisch (Germany / baritone), the Heath Quartet (United Kingdom / string quartet) and Yi-Ping Yang (Republic of China/ percussion). Highlights will be performances of Liszt’s Petrarca Sonnets, Barber’s Dover Beach for string quartet and baritone, Shostakovich’s Piano Quintet and Martland’s Starry Night. Host of the evening will be the well-known Dutch actor/singer Edwin Rutten.